Home Costs > How Much Does a Lennox Air Conditioner Cost? How Much Does a Lennox Air Conditioner Cost? 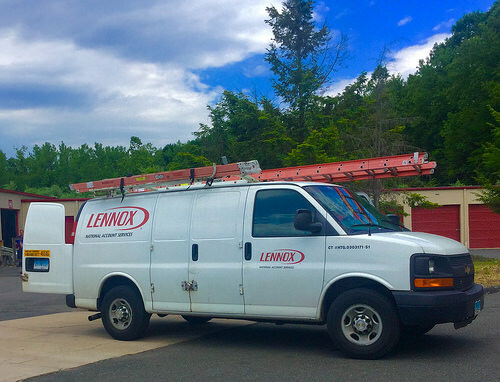 Lennox has been in business since 1895 and has currently expanded to offer residential and commercial customers one of the largest product selections of air conditioning models in the industry. The price of a Lennox air conditioner, as with any air conditioner brand, will depend on the model, your current setup and the contractor you choose to install one. Before a contractor even considers installing a unit, he or she will first measure your system by what’s known as the “Manual J” calculation. This will take in factors such as the type of insulation you have, the type of windows, where you live and which direction your home faces. NOTE: These are just estimates we received from local contractors and your quote can greatly vary depending on your geographic location. The prices will raise slightly as you increase the tonnage of the unit. At Costco, you can often find the Lennox XC25 or a similar unit for sale. According to those who have received a quote, the price was around $10,000 fully installed, plus a Costco cash card depending on the promotion. Lennox air conditioner features multi-stage compressors, which are available on the higher-end SEER models, variable speed technology, 26 SEER technology and R-410a refrigerant. The company offers three series: the Merit (13-16 SEER), the Elite (15.5-20 SEER) and the Dave Lennox Signature (18.5-26 SEER). All new Lennox air conditioners come equipped with a 10-year limited warranty on the compressor and a five-year limited warranty on the covered components. If your ductwork is in poor shape, then a contractor may want to either want to replace certain sections or even increase the size in order to maximize the efficiency of the current setup. A programmable thermostat, if you don’t have one, may be recommended to help you save on heating and cooling costs. Some contractors may throw one in while quoting, whereas others may charge an extra hundred dollars or so if you wanted one. The average decibel rating is around 59 to 70, depending on the unit. Don’t focus solely on the price, but rather, a highly rated unit that works for your situation. The same can be said about an HVAC contractor. Always get as many quotes as possible to ensure you’re working with an experienced professional. If you don’t know where to start looking for quotes, we highly recommend HomeAdvisor.com, a free service that connects you with local contractors. You simply explain your job and they can contact you with quotes. Look for the latest tax credits and rebates to see if you qualify for any. Slightly used Lennox air conditioners can be found on eBay for a fraction of the retail price. If you know of a professional who’s willing to install a unit, then this may be a great way to save more than $1,000.